This Speedotron DM802B LV Deluxe 3 Light System has everything you need for product photography, portraiture or ecommerce. The D802B power pack is at home in the studio or on the road. 800W/s of power can be channeled symmetrically or asymmetrically to up to 4 heads. A half power switch is provided for even greater versatility. The D802 recycles in a quick 3.2 seconds at full power. The M11 CC flash head is equipped with a fixed 7.0" reflector that accepts snoots, diffusers, gel holders, barndoors and grids for versatile light control. It uses a bright 150W modeling lamp. The MW3U CC flash head is designed to be used primarily as a hair light or background light; its small size makes it ideal for hiding on the set. It can handle up to 400W/s, and makes an excellent, affordable fill light. 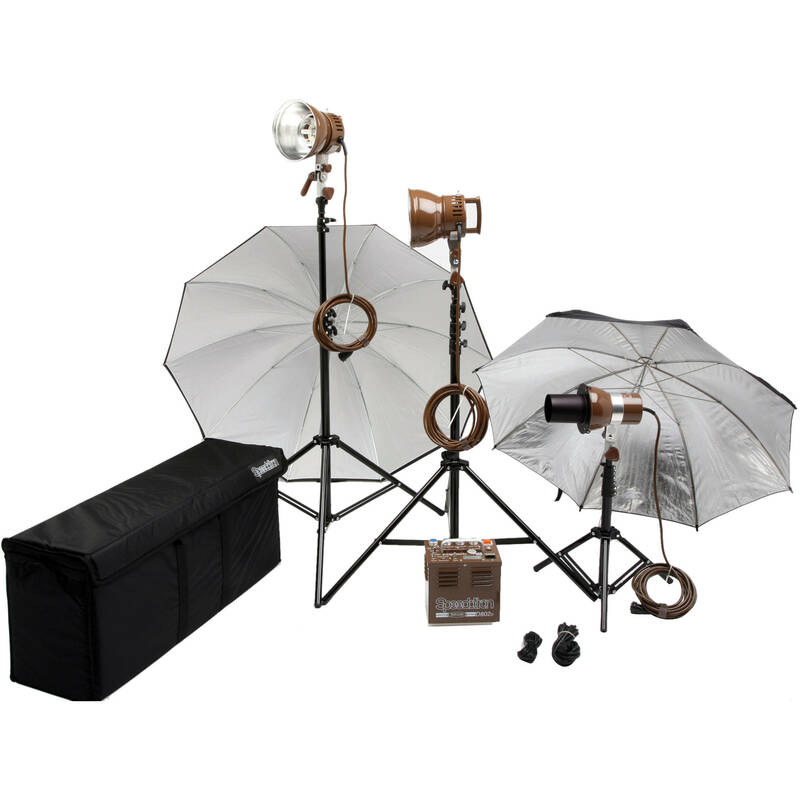 Besides the D802B pack, this kit includes 2- M11 CC heads, 1- MW3U CC head, 2- 8.5' light stands, a 4.0' light stand and a sync cord. A 45" adjustable, silver umbrella and a 54" white umbrella with removable black backing round out the kit. It all fits in the included 4-section carrying case. Box Dimensions (LxWxH) 36.0 x 17.0 x 12.0"